Here is what we think is close to the final Experimental Soaring Association Workshop schedule of speakers for the Labor Day weekend here at Mountain Valley Airport (L94). Note that it is of course still subject to change but we are probably getting close. 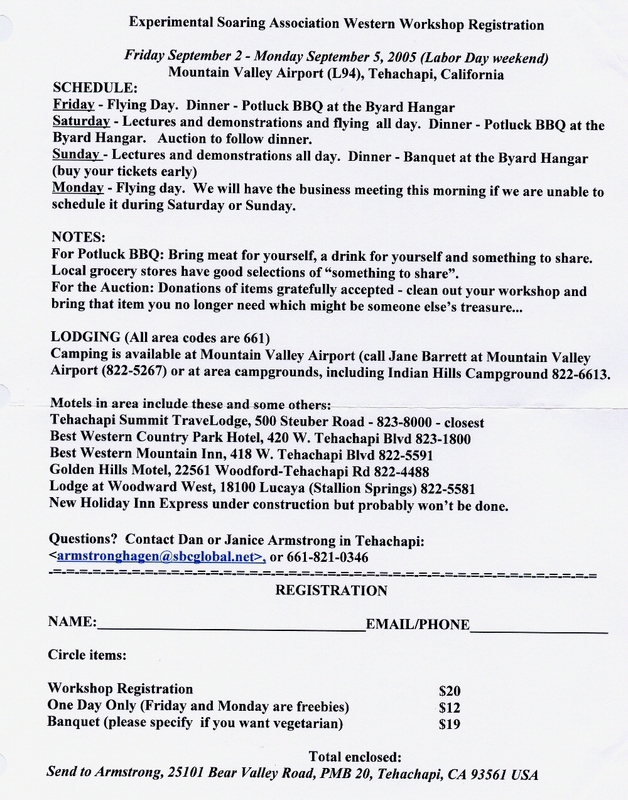 Remember that Friday night is a potluck BBQ, Saturday night is a potluck BBQ and the auction (bring stuff), and Sunday evening is the annual hangar banquet (catered) with John Ashford of the Gliding Federation of Australia as the featured speaker. This schedule looks spectacular. Steve Adkins, could you put it on the website? A special special thanks to the team of Bruce Carmichael and Al Bowers for superb work! Hope to see everyone soon!!! Danny Howell on " The Light Hawk-Reaching For 60 feet per minute or 1 foot per second sink rate"
Catered by the Apple Shed. Banquet Speaker is John Ashford of Australia - "Gliding Downunder and Taming the Regulator".